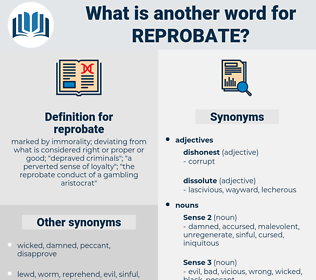 What is another word for reprobate? marked by immorality; deviating from what is considered right or proper or good; " depraved criminals"; " a perverted sense of loyalty"; " the reprobate conduct of a gambling aristocrat"
decent, upright, virtuous, clean, pure, just, good, moral, honest, kind. acquit, uncorrupted, Uncorrupt, absolve, pardon, incorrupt, approve, justify, exonerate, incorruptible. But much as I reprobate the act, much more do I reprobate the conduct of those who stood by and saw the outrage perpetrated. As one item of the cost of his adventure in County Clare he must pay two hundred a year to that reprobate, the Captain, as long as the reprobate chose to live, - and must also pay Mr. Crowe's bill for his assistance. rubber boot, reproved, riverbed, river boat.